This lightsaber prop was designed in the style of the Old Republic era. It was designed as a film prop, so there are no electronics involved. 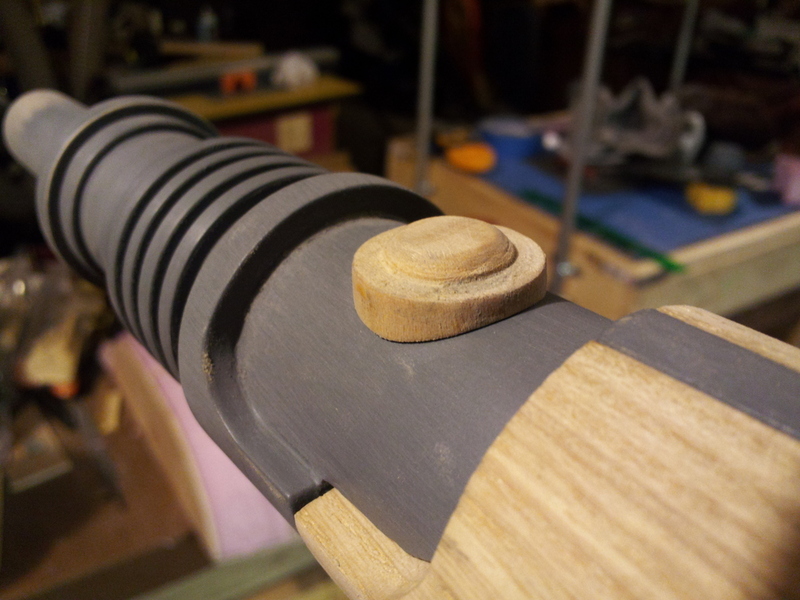 There's a 3/4" diameter cavity in the emitter into which a 3/4" wooden dowel rod is attached. There's a pronged tee nut embedded in the base of the cavity into which the dowel is threaded when installed. This makes the blade easily removable during filming. The intent was to have a rugged, functional, yet refined look to it. After doing some research on the designs from Star Wars: The Old Republic, this image caught my eye the most. Based on its inspiration, 5 alternatives were developed. #2 ended up being the winner, which was drawn up using Google SketchUp, with minimal cosmetic modifications. The construction is one solid piece with a central tang, with two wooden handles attached on either side. The first component of the master was the emitter, which was made out of maple and turned of the lathe. Then a piece of PVC pipe was trimmed and installed onto the turned piece. The handle was turned on the lathe and then cut in half length-wise. Since the wood grain texture is required for the final product, no filler or primer were used on these pieces. The tang, end cap, and button were made of a combination of maple and MDF. Finally, a piece of wood was installed on the tip of the emitter to serve as the pour and ventilation spouts. A box was made to serve as the rigid structure for the mold. Clay was used to form the separation plane between the top and bottom halves of the mold. The dimples serve as registration keys so the two halves of the mold can be aligned properly. Once the mold was complete, a 3/4" dowel rod is used to make the cavity into which the blade is inserted. At the end of it is a pronged tee nut, that will be embedded into the plastic and allow the blade to be installed and removed via a threaded rod just like a pool cue. The castings are made of Smooth-On's Smooth Cast 300 filled with 1/3 aluminum powder by volume. The aluminum powder can be polished to look like chrome. The same mold/casting process was used to make the handle copies. Instead of aluminum powder, pecan flour was used as the additive to simulate the wood color and texture. The wood grains transferred perfectly. Brown shoe polish was rubbed into the grains to give it more of a wooden appearance. The final result is a Jedi lightsaber that definitely has the look and feel of one straight from the old republic. 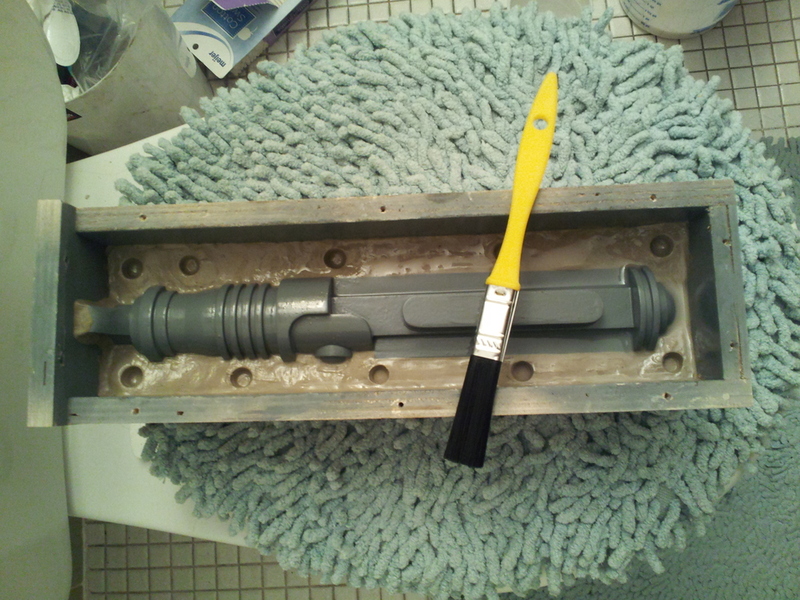 Since this is a film prop, the blade is just a piece of 3/4" poplar wooden dowel painted florescent yellow. D-rings were added later to the base so they could be clipped to the belt of the Jedi costume. Posted on December 4, 2014 by Michael Kretschmer and filed under Prop and tagged prop star wars lightsaber jedi jedi lightsaber.